Charak Puja is a very delightful folk festival, also known as Nil Puja, celebrated in Bengal on Chaitra Songkranti, the last day of the month Chaitra. This is a view of a large procession in Calcutta during Charak Puja. The painting reminds us of the lively version of Charak festival given by Bishop Heber of Calcutta: “All the persons who walked in the procession, and a large majority of spectators, had their faces, bodies, and white cotton clothes daubed all over with vermilion, the latter to a degree which gave them the appearance of actually being dyed rose-colour. They were also crowned with splendid garlands of flowers … many trophies and pageants of different kinds were paraded up and down, on stages drawn by horses, or bullocks.” Charak Puja, a colourful festival was celebrated all over Bengal with much pomp and show on the eve of the Bengali New Year. As described in হুতুম প্যাঁচার নকশা by Kalipranna Singha, the famous mid 19th century Bengali satire “The city of Calcutta is rocking at the sound of drums, the devotees are warming up, the blacksmiths are making all kinds of hooks”. 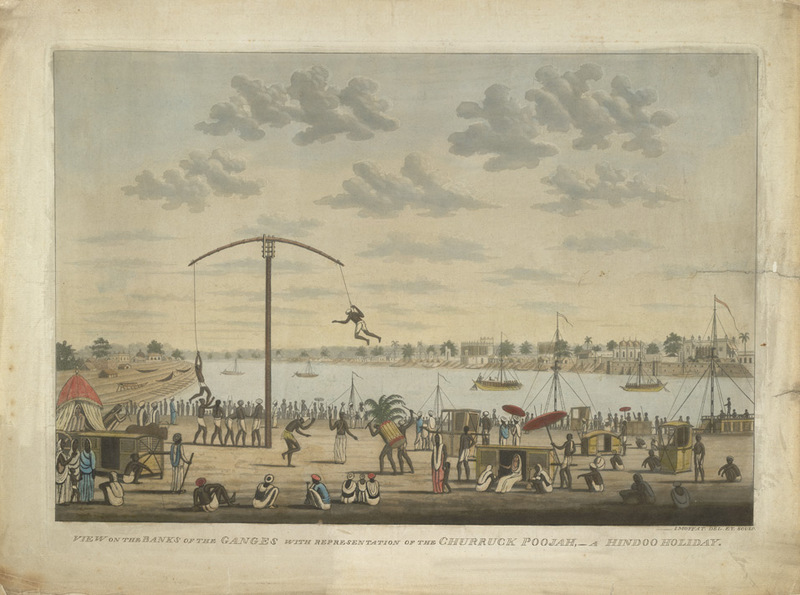 The festival was known to the English in Calcutta as “hook swinging festival”. 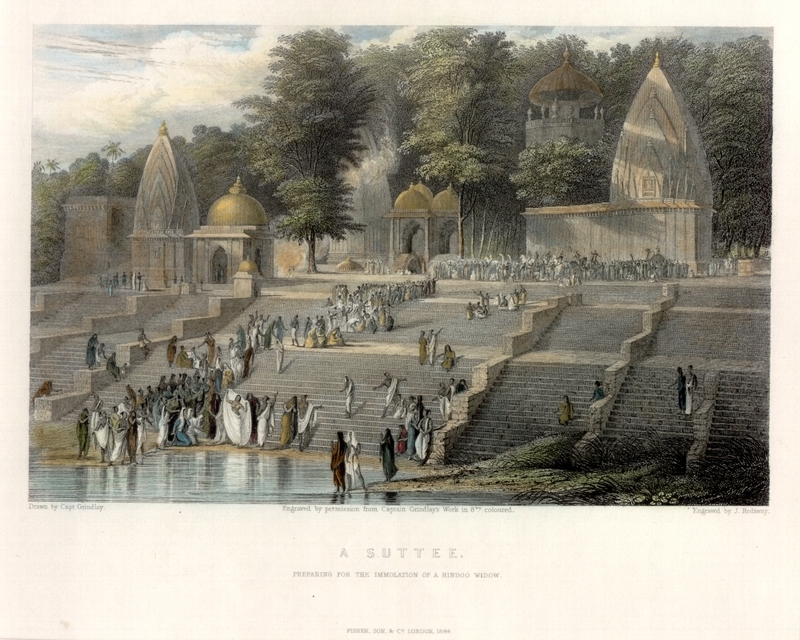 This coloured lithograph is taken from plate 9 of Sir Charles D’Oyly’s ‘Views of Calcutta and its environs’ in 1848. Preparing a Hindu widow for immolation as seen in this painting is a realistic depiction of the rite of Sati as was practiced in Hindu society. The practice was formally banned in 1798, but continued in the surrounding areas. From 1812 onwards, it was Raja Rammohun Roy who started his own campaign against Sati. His petition against Sati also took place in 1829. The practice finally was banned by The Bengal Sati Regulation of 1829 – a legal act promulgated in British India under East India Company rule, by the then Governor-General Lord William Bentinck. This made the practice of the immolation of a Hindu widow on the funeral pyre of her deceased husband—illegal in all jurisdictions of British India and subject to prosecution. 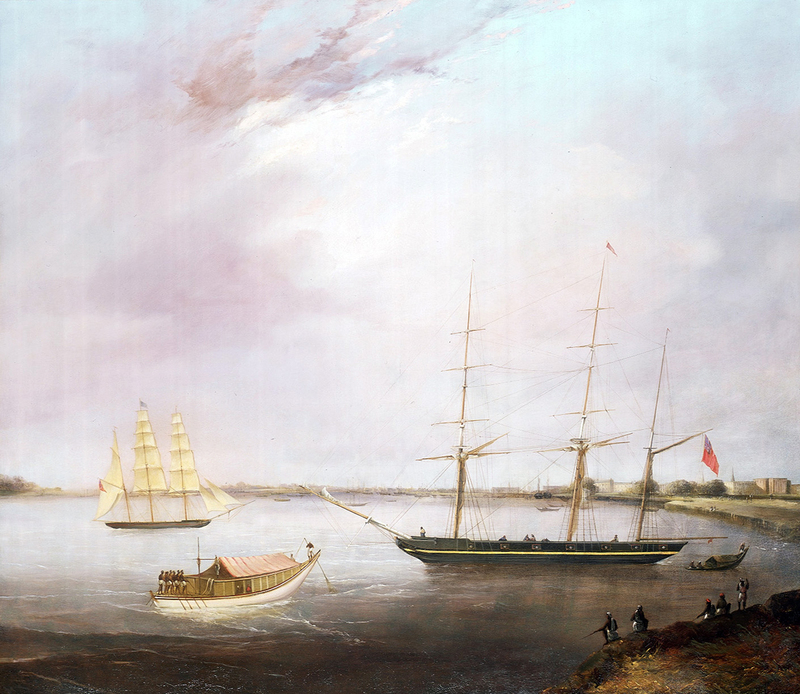 This painting is made by Robert Melville Grindlay (1786-1877), a self-taught amateur artist, who served with the East India Company’s military service from 1804-20 and during this period made a large number of sketches and drawings recording the life and landscape of India. This image shows the imposing theatre on the corner of Theatre Street and Lower Chowringhee Road. The whole site between Chowringee Road and Elysiam Row (Now Lord Sinha Road) was occupied by the Chowringee Theatre. The adjacent house to the north was known as Ballards’ Place. The expenses of the construction and the cost of the materials for the stage were borne by a number of gentlemen subscribing amongst themselves the shares of Rs. 100 each. It was beautifully crowned with a dome. 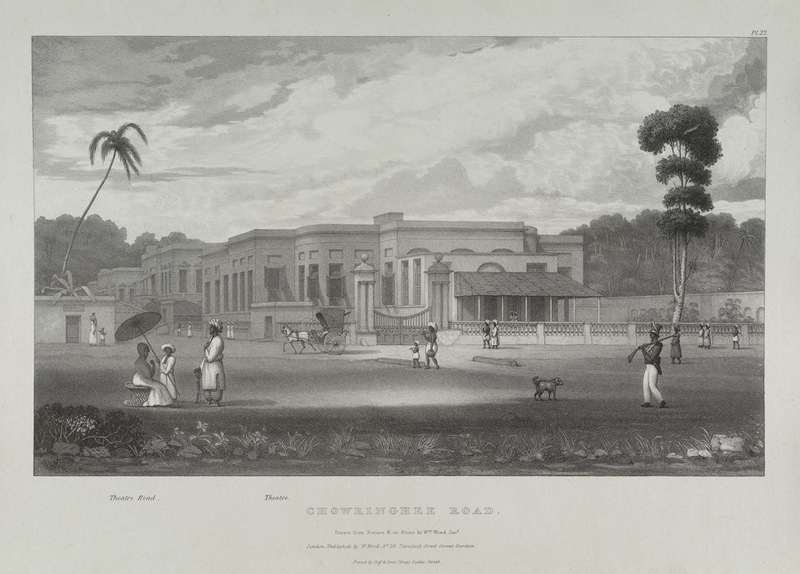 The Chowringhee Theatre (1813 to 1839) was the principal theatrical venue in the city. Some affluent British theatre-lovers along with a few Bengali elites founded Chowringhee Theatre. Accordingly, this also came to be known as the ‘Subscription Theatre’ Among the illustrious patrons who donated generously for this Theatre, the names of Mr. Hares Heman Wilson, D.L. Richardson, Dwarakanath Thakur etc. deserve mention. It was inaugurated on 25th November, 1813 and the maiden play held here was a remarkable tragedy named ‘Castle Spectre’. Several dramas were performed here in course of time. The actors in the initial days were amateurs. Later, some renowned professional actors joined this troupe breaking away from the big banners. But, the Theatre was staggering due to acute financial stringency. In 1835, Prince Dwarakanath Thakur purchased it and made some drastic renovations. Unfortunately, in 1839, this Theatre was completely incinerated. After that it was never revamped and play acting was never resumed here. – Interestingly, the female roles at the theatre were played by professional actresses but male roles were taken by amateurs, such as William Princep, whose memoirs describe his theatre work in detail, both as actor and set designer, and give us insights into the running of the building. This lithograph of painting dated 1833 is taken from plate 22 from ‘Views of Calcutta’ an album of paintings by William Wood. 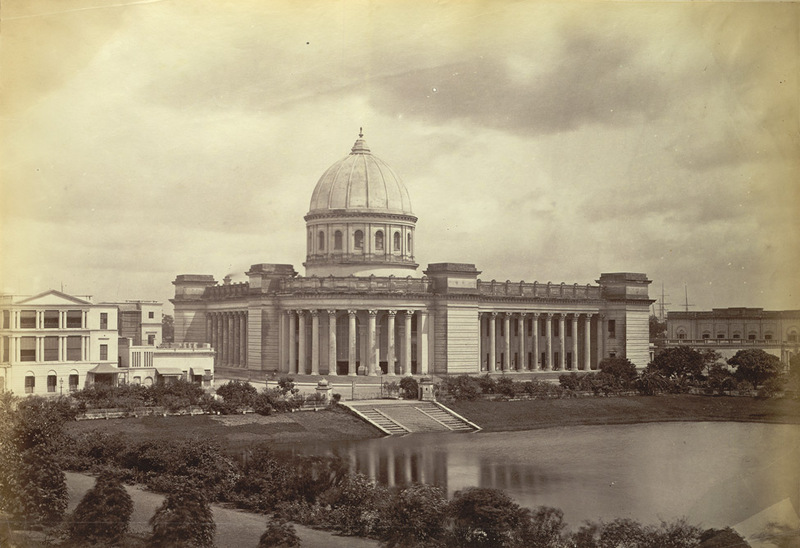 Arthur Grote (1814–1886) held the offices of Chairman of Revenue Board of Bengal, and President of the Royal Agricultural Society of India, and of the Asiatic Society of Bengal. He wrote many papers on Natural History subjects.